Alabama - Plastic silver barrel ballpoint pen with colored grip and a pocket clip. Prices include a one-color imprint. On first order, add $28.00 set-up fee. Reorders subject to $15.00 setup. We stock national stock logos. 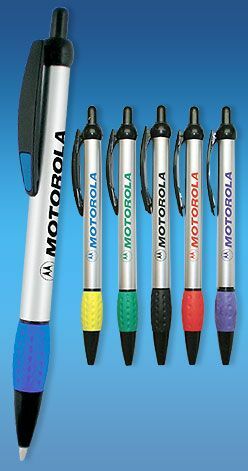 Tags: Alabama - Plastic silver barrel ballpoint pen with colored grip and a pocket clip.